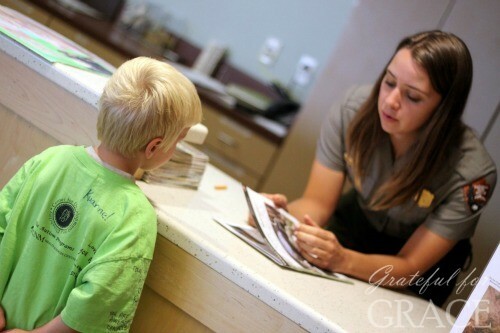 If you are traveling anytime soon… squeezing in one more trip before school or taking a fall trip…. 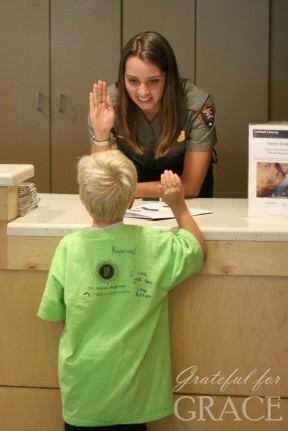 and if you are are near a national park, I highly recommend the Junior Ranger program. We first enjoyed this aspect of the national park years ago with HB, but last May The Youngers found the fun. To help us all learn about our new home, we went to Sandia Crest The ranger asked the kiddos if they wanted to participate in the Junior Ranger program and they immediately jumped right in for the fun. I thought it was going to be too “school”ish for them to do it just because. I was wrong. They loved learning on the trail and having some specific plants/animals/information to look for during our time on the mountain. I loved learning about the bears and mountain lions. Or not. The badges were bonus, but definitely desired. 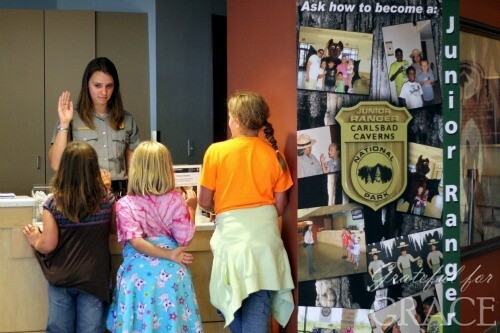 When we hit Carlsbad Caverns a few weeks ago, the girls grabbed the chance to earn another badge. They filled in pages and learned plenty on our “hike”. We sat on the floor of the store finishing their work, letting strangers step over us. Ahem. Paul Louis looked at me wide eyed. Somehow he had missed getting his book and I figured he wasn’t that interested. So, we asked for a book and sat on the floor again (in the entry this time, much more room for people to ignore us) and talked about what we saw in the caverns. I was happily surprised at the information he retained and shared with me. The ranger asks each participant questions to be sure s/he did the book and actually learned something. His answers made her smile. The preciousness of it all caught me off guard. This sweet boy took his oath very seriously. Ranger Girl (not her actual name, though I bet she wishes it was) had to control her facial expressions to remain serious because he was all intense and formal at this austere moment. It was adorable. The creme de la creme for me was the exhuberant joy he displayed gettting his badge and certificate. Goodness, you would have thought it was a trophy. They still talk about the Caverns of course (Esther has even requested stalagmite and stalactite shaped cake balls for her birthday and drew the Hall of Giants on my anniversary poster), but they badges and certificates are proudly displayed. It was totally worth it. Especially since it was free. 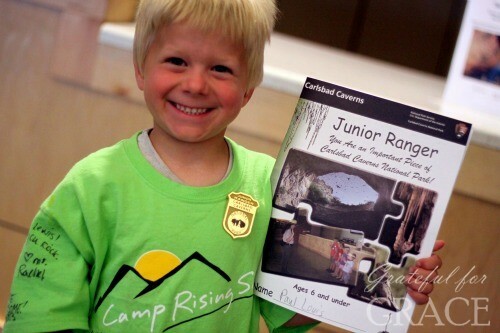 The Junior Ranger program rocks! Have you done it?